The average price of a gallon of unleaded gas dropped almost two cents during the past week, according the latest weekly survey from the U.S. Energy Information Administration. The price of gas settled at $3.67, which is down from 2014’s high of $3.71, a dubious achievement attained only two weeks ago. Unlike last week, when favorable volatility pushed Midwestern gas prices down significantly, this week’s gains were lead by moderate declines in the Lower Atlantic, Gulf Coast and West Coast regions. Each district survey area enjoyed a decline of about three cents. 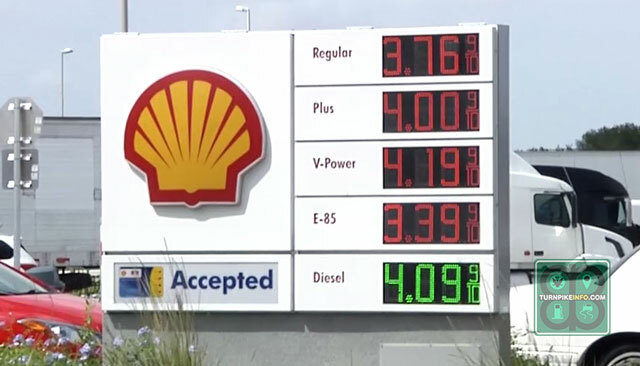 The drop in prices on the West Coast was due largely to a deep decline in prices in California, where the average price of gas fell by more than a nickel per gallon. That relief may be scarcely noticeable, however, for a state where the average price of gas is still about $4.17 per gallon. Drivers in Los Angeles and San Francisco are still paying more than their state’s average. For drivers across the broader West Coast region, the price of fuel remained mostly flat, although prices did nudge upward a penny in Washington State. This week’s gas price survey provided Midwestern drivers a complete opposite of the story that played out last week. Traditionally a volatile region, gas prices in the Midwest fell almost seven cents per gallon last week, led by a breathtaking 12¢ per gallon decline in prices in Ohio. This week, however, the cost of gas rebounded by 8¢ in the Buckeye State, which helped halt what might have been a broader regional price decline. Because of Ohio and other retail pricing hot spots, the Midwest gas price average did not move, remaining at $3.60 per gallon. However, drivers across Minnesota enjoyed a drop in prices, as did many motorists in Illinois. In fact, the price of gas in Chicago fell by 10¢ per gallon for regular unleaded. The mixed news for U.S. drivers did not apply so unequally to truckers. Most of the nation’s haulers are paying somewhat less for diesel fuel over the past couple of weeks, and the declines that began at the end of April have continued, albeit at a slow pace. The average price of a gallon of diesel is now about $3.95, although for many truckers along the East Coast, the price ranges anywhere from $4.04 in New England to $4.16 along the Lower Atlantic states. 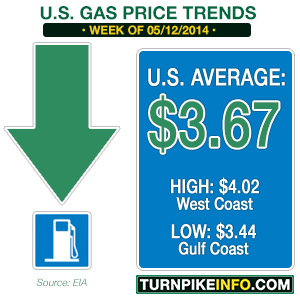 The price of gas on Florida’s turnpike is well above the average for the Lower Atlantic region. In urban areas, the price can be significantly higher. For instance, in the Lower Atlantic states, the average price of a gallon of diesel is about $3.92 per gallon. However, the price of diesel was $4.09 at a service plaza on Florida’s Turnpike Sunday. In the inner city, the cost of that same gallon of diesel is as high as $4.25, far in excess of the highest regional average price, according to the EIA survey. Although the amount of crude oil being produced across North America continues to grow, the stockpiles of crude at the Cushing, Oklahoma storage facility continued to decline during the past week. Financial analysts interviewed by Bloomberg expected the stockpiles at Cushing to continue to decline, putting upward pressure on the price of West Texas Intermediate crude. The price of WTI has come down from its recent highs, and the June contract had even been trading just under $100 per barrel last week. However, the price of crude has moved back over $100 per barrel. Bloomberg observed the cost of domestic crude is up about 2.2 percent for 2014, but compared with the trading prices only six months ago, the prices are up almost nine percent since Thanksgiving. That is in line with the overall increase since last year at this time, which is a contributor to the year-over-year gas price increases consumers have experienced. The annual gas price differential is substantial, given that the EIA had forecast gas prices to fall through much of 2014. The EIA has revised a number of pricing and supply forecasts this year, amid a host of unexpected factors, mostly in overseas markets. Geopolitical instability and fuel supply disruptions overseas first pushed Brent Light Sweet crude significantly higher starting in the late summer of 2013, and by the end of Thanksgiving, Brent was soaring toward $110 per barrel, even while WTI was plunging. Supply problems overseas persist, and the Ukraine crisis has continued to cause instability in overseas markets. That means what was supposed to be a cheaper summer driving season for Americans is not likely to happen this year. The current average cost of gas is about seven cents higher on a nationwide basis, but that figure is tempered only because of year over year price drops in the Midwest and Rockies, two regions that are notoriously volatile when it comes to pricing. Price declines for those areas are concentrated, at least this week, primarily in Minnesota and Colorado, respectively. For drivers in the state of 10,000 lakes, the cost of a gallon of unleaded is down a stunning 38¢ versus last year, while in Colorado, the cost of fuel is down by about 19¢. The Colorado trend is exactly the opposite of what most drivers are experiencing, and it is part of the reason the national averages scarcely reveal the true annual gas price increase. For most drivers along the East Coast and down to the Lower Atlantic states, the cost of a gallon of gas is anywhere from 19¢ to 21¢ higher. Even in regions that have enjoyed a price break during the past couple of weeks, such as the Gulf Coast and West Coast, prices are 7¢ and 8¢ higher than last year, respectively.